Wittenborg University Staff and Students Enjoy a Christmas Drink at Jeroen’s Café in Apeldoorn! 2014 -Welcome to migrant workers from Romania and Bulgaria! WUP 21/12/2013 - What a year 2013 has been! - Anesca Smith looks back over the year! 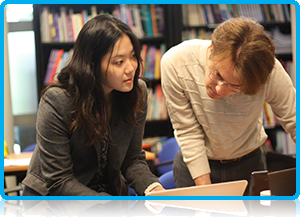 Wittenborg University made big strides in developing the quality of its academic programs and expanding its reach, including a successful partnership with the University of Brighton in the UK. 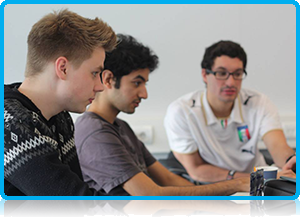 In international education there was a further surge in the mobility of international students worldwide, with The Netherlands proving to be one of the most popular study destinations in Europe. In the rest of the world 2013 remained a sober year on the economic front, but there was also cause for celebration as well as tears like the death of former South African president and world icon, Nelson Mandela, this month. Here is looking back at a year full of ups and downs. 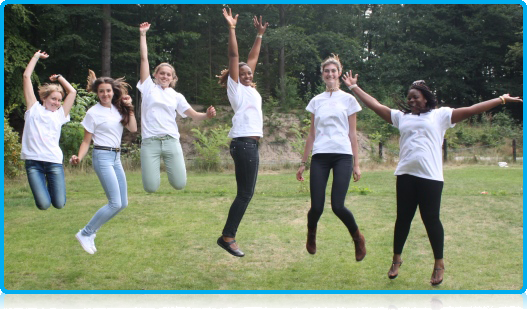 The launch of the “Whatsapeldoorn” website - a platform for and by students from Wittenborg University, Saxion University and the Theological University - and the issuing of the Apeldoorn Student Card whereby students benefit from discounts at local cinemas, restaurants, gyms and even beauty salons. Wittenborg directors, Peter Birdsall and Maggie Feng, officially sign the Act that removes the Dutch name “Hogeschool” from Wittenborg. 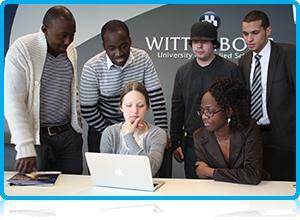 Hereafter it will simply be called Wittenborg University. Pope Benedict XVI resigns. His decision to step down as leader of the Roman Catholic Church made him the first pope to relinquish the office since 1415. Wittenborg University and the University of Brighton successfully complete the validation of a joint Master of Science degree programme in International Hospitality Management, joining the MSc International Events Management and MSc International Tourism Management as part of Wittenborg's School of Hospitality and Service Management (SHSM). 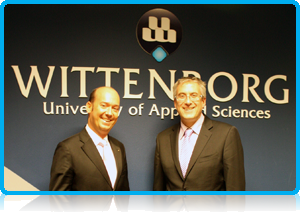 Wittenborg and the ANGELL Business School in Freiburg, Germany, sign a Memorandum of Understanding outlining how the two institutes plan to work together and collaborate in the coming 5 years. Orange’s the word as the first Dutch king in 123 years, king Willem-Alexander, is inaugurated on 30 April 2013, following the abdication of his mother, Queen Beatrix. During the Boston Marathon on 15 April two bombs explode, killing three people and injuring hundreds more. While the Dutch government mulls over how to bind talented non-EU graduates to the economy in a bid to fill vacancy gaps in its labor market, the Chinese government announce plans to drastically relax its visa regulations for knowledge migrants who will soon be able to receive Chinese visas valid for up to 5 years. Changes to the Dutch visa regulations take effect on 1 June 20-13. The Modern Migration Policy Act simplifies the application procedures for students wanting to come and study in the Netherlands. 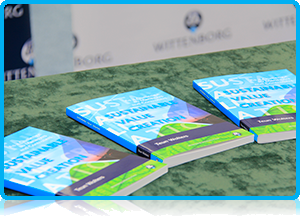 Wittenborg University Press (WUP) launches its first book publication. Entitled 'Sustainable Value Creation as a Challenge to Controllers and Managers’, it was penned by Wittenborg senior lecturer, Dr Teun Wolters. 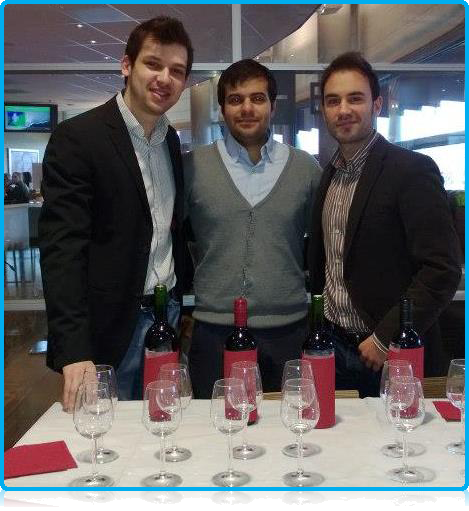 Wittenborg and Wine - A Unique Blend - If you asked Wittenborg graduate Pouyan Kalanaki 4 years ago who he would be most likely to start a business with, fellow graduate Grigorios Pavlidis and Yvan Lopez would not have been his first answers. “Greg and I didn’t get along when we first met,” says Pouyan “but everything changed over a lunch at the local Chinese Wok.” After learning more about each other’s Iranian and Greek backgrounds, Pouyan and Greg found out that they actually have quite a lot in common, including the ambition of starting their own business. A few months later, Greg and Pouyan met Spanish student Yvan Lopez and a friendship began to form among this trio that would lead to a business partnership under the clever moniker: The Three Wineketeers. The race is on between countries wishing to attract international students from rising economic powers like China, Russia, Mexico and India - Britain declares its intention to seize the opportunity while both the Netherlands and France simplified its student application processes. Not only the beginning of a new academic year at Wittenborg but also the first cohort of students following the so-called EuroBA - allowing them to spent part of their studies in the UK, Germany and France - arrive. 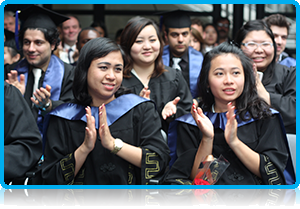 All three Master of Science programmes - International Hospitality, International Tourism Management and International Event Management - are offered jointly by Wittenborg and the University of Brighton. In addition, Wittenborg this September admitted a record number of new students - more than 50 - with the new starters representing between them 20 nationalities. September sees a new Education Act in the Netherlands entitled ‘Kwaliteit in Verscheidenheid Hoger Onderwijs’ which is literally translated as Quality in Diverse Higher Education. in Freiburg, Germany, which brought together more than 175 delegates representing some of the world's top hospitality schools, and saw the presentation of over 60 papers, ranging from subjects in hospitality to tourism and event management. Peter, or “Zwarte Piet” are racist or not. Even the United Nations chirps in, calling for a probe while Dutch supporters set up a Facebook-page called Piet-itie (Pete-ition) in support of Zwarte Piet. It gains more than 2,1 million “likes”. NRC Handelsblad reveals the US has been spying on the Netherlands since 1946. Students at Wittenborg takes part in test-driving the world’s first gamified MBA program as created by Wittenborg’s visiting professor James Bowen PhD, from the University of Ottawa and Dr Juris Ulmanis, from Riga Business School and their team. The Dutch minister of Education, Jet Bussemaker, rolls out out a five-step plan to retain talented, international students in the Netherlands by making it more attractive for them to enter the Dutch labour market after their studies. It is entitled “Make it in the Netherlands” and outlines a host of actions the government will take in cooperation with education institutes and business. The world mourns the death of South Africa’s first democratically-elected president, Nelson Mandela. Students and staff at Wittenborg already in July wrote about what the iconic world-leader meant to them.